VTT Technical Research Centre of Finland Ltd is a state owned and controlled non-profit limited liability company established by law and operating under the ownership steering of the Finnish Ministry of Employment and the Economy.As an impartial non-profit Research and Technology Organisation (RTO) and with the national mandate and mission to support economic competitiveness, societal development and innovation, VTT carries out research and innovation activities for the needs of industry and knowledge-based society. 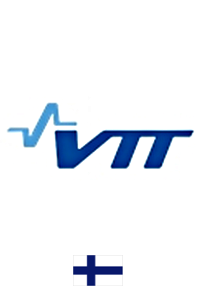 In 2013, VTT’s turnover was 279 million €, with highly educated personnel of 2600. VTT’s activities are focused on three areas: Knowledge intensive products and services, Smart industry and energy systems, and Solutions for natural resources and environment (SONE). VTT is impact-driven and from its wide multitechnological knowledge base, VTT can combine different technologies, produce information, upgrade technology knowledge, and create business intelligence and value added for its stakeholders.Over the years, VTT has gained vast experience from participation in numerous European R&D Framework Programme projects and within various thematic programmes. VTT is ranked among the leading European RTOs.In 2013 alone, VTT was involved in 471 EU-funded research projects.